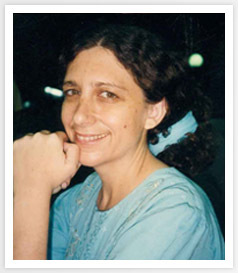 My name is Ruth Dorrit Yacoby and I am an international artist, painter and poet, who lives in the south of Israel near the Dead Sea, at the edge of the Judean desert. I have held 64 solo exhibitions in major museums and galleries across five continents. In the year 2000 I presented a solo exhibition in the Vatican titled "Gate of Tears, Rain of Roses", held under the aegis auspices of Pope John Paul II and accompanied by an audience with him. was honoured to have a private audience with his holiness. Since 2008 a permanent exhibition has been open to the public at "The center for art & creation "The Woman of the Thousand Voices", Ruth Dorrit Yacoby" in Arad, accompanied by the film and the book. My work is an ongoing quest, a long corridor, a journey from the Gate of Tears to the Rain of Roses. A journey of death, fragmentation, salt, and bleeding, to a territory of healing, stitching, comfort, and vocation. Her creation is a transition from the stain of blood to the stain of light, from the muffled pain of generations, from the place of profound death, to rebirth. After a thousand lengthy deaths and slow bleeding at nights, wrapped in an illuminating cloak of light, she can now soar. I constructed a space, a total place, intense, defined, and composed of many elements, Paintings and written and heard poems. The paintings themselves were executed over a long period of time, outdoors, and were left there, exposed to the elements of the desert, the salt from the Dead Sea, the blurring sun, the wind the and sandstorms. The salt is raw, unprocessed salt; it is an ancient, primordial element embedding an essential aspect of preservation. It absorbs the disease and the sorrow, remove the curse and enables life. Like mothers tear, it contains the sorrow as well as the capacity to cure it. The works were created in the desert, exposed to the physical and emotional substances of the place. Dust, clay, prayer beads, sorrow, memory, cycles of life, beginning and end, archaeology of the soul, hope, and life. The works transpire across time, transcending and containing it. Looking into the clear mirror of eternity where the times of recollection and reawakening from oblivion fuse together, becoming part of the memory, lighting the candle in the eternal fields of light, a time in which all paths are open and healing is possible. The Center for Art and Creation in Arad is a territory that transcends the limits of a specific time and place, existing as a planet onto itself. This crowded, total installation appears as a mysterious cave – an archive of the history of the world. This is the site where the entire film unfolds. The story of this center is the story of the primeval journey undertaken by the Shekhina, the Great Mother, the Matriarch Rachel – a journey of wandering and exile, which ends with redemption, healing, and a promise of solace. Every mother is a messenger, the mother of all mothers, a queen mother. You will go from land to land / Be the bleeding heart of the world/ Its screaming mouth / Be the living heart of the world / Its poetry. Within a space measuring approximately 700 square meters, the visitor undergoes a personal transformation as he journeys from the land of the dead and of oblivion to the land of life, the source and origin, the time of all beginnings, the genesis of life, joy, color, and poetry born of the heart, at the root of the soul. This primal experience of life, which is integral to our being in the world, has long been forgotten. This unique space enables us to re-experience it, and encompasses all dimensions of time. The Center for Art and Creation draws visitors from throughout Israel and the world. Since its foundation (with the support of the Israel National Lottery Council for the Arts), it has been visited by thousands of visitors. The Center also hosts events and concerts performed by Shlomit Yacoby, who sings liturgical melodies from the ancient Near East as well as her own original compositions. This singing brings solace and healing as it echoes among the artworks, and the concerts are experiential and meditative. "I regard her as one of the most remarkable, outstanding artists in both Israel and the international art world. …Dorrit Yacobi's work is unique and highly profound, possessing the rare qualities of Great Art." "…the artist Ruth Dorrit Yacoby creates a Vision of the world which is an artistic language of a general human idea. Her paintings seems to be a symbol of the real world in a matter of a transcendental experience". "Ruth Dorrit Yacoby's art is rooted in the depths of a personal emotional experience, in which suffering is perceived as a continuous, primeval state of existence. Subjective events, just like natural phenomena, are experienced as an expression of magical powers and as an embodiment of a spiritual force that appears to unify the entire world. This mode of existence is closely affiliated with religious, mystical experiences and with the ancient world of myth, and is thus interpreted as a journey: a transformative subjective and spiritual process, much like the journey of mythical heroes to the underworld and back to the world of the living, or like the soul's journey towards redemption and eternal life. In Yacoby's art, this journey unfolds between the polar extremes of birth, death, and rebirth, in a cyclical movement that heralds the resurrection of life from within death". Ruth Dorrit Yacoby is an internationally recognized artist, painter, and poet, whose works have been featured in over 67 solo exhibitions worldwide; they have been shown in major galleries and museums in New York, Toronto, Montreal, Berlin, Tokyo, Beijing, Seoul, Mexico City, Lima, and Buenos Aires, as well as at the Tel Aviv Museum and the Israel Museum. In 2000, her solo exhibition "Gate of Tears, Rain of Roses" was featured at the Vatican in Rome blessed by the Pope. In 2008, a permanent exhibition of her works was inaugurated at the Center for Art and Creation – The Woman of the Thousand Voices. This exhibition is housed in a former industrial hangar in Arad, on the outskirts of the Judean Desert, along the road leading to the Dead Sea. The exhibition is accompanied by the film The Woman of the Thousand Voices. My finest works are now for sale and can be purchased. Many of my works are displayed in galleries around the world. Every artwork of mine is unique and one of a kind.